Nominations for the 2019 AFL School Ambassador of the Year awards will open at the start of Term 2, 2019. The awards recognise teachers who have run outstanding Australian Rules Football programs in their schools from Term 3, 2018 to Term 2, 2019. To nominate check here at the start of Term 2. Two deserving winners will claim a trip for two to Melbourne in May 2020 to attend the AFL Volunteers Function. Nominations by school staff, community football groups and WAFC employees can be sent in for outstanding programs run from August 2018 to July 2019. Nominees must be registered School Ambassadors. The AFL School Ambassador (AFLSA) program, introduced into WA schools in 2004, aims to produce enhanced educational outcomes in literacy, numeracy, health and physical education by providing quality resources to schools and by recognising and rewarding teachers who strongly promote football in their school and community. Over the past 14 years there have been more than 60 category winners from schools across the state. The AFL School Ambassador, from a WA primary school, judged to have made an outstanding contribution to the AFLSA program during Term 3 2017 to Term 2, 2018 will win a trip to Melbourne to attend the AFL Volunteers Function in May 2020. 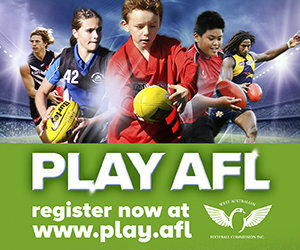 At the function a national Primary School winner will be announced and will be invited to attend the 2020 AFL Grand Final. The AFL School Ambassador, from a WA Secondary school, judged to have made an outstanding contribution to the AFLSA program during Term 3, 2018 to Term 2, 2019 will win a trip to Melbourne to attend the AFL Volunteers Function. At the function a national Secondary School winner will be announced and will be invited to attend the 2020 AFL Grand Final. The selection process for all AFL School Ambassador of the Year awards is as follows. All AFL School Ambassador of the Year nominations for all categories will be provided to a WAFC Panel, comprising Education Team members, who will select the finalists for each category (max 5 per category). The State Judging Panel will review the Finalists and select all the winners. Another year of innovation and dedication from WA AFL School Ambassadors was celebrated at the 2018 AFL School Ambassador Awards at Claremont Oval on Thursday 9th August. Finalists and their school principals were invited to the gala event which recognised the outstanding work that Western Australian teachers do to promote Australian Football within our schools. Special guests in attendance included Member for Bicton, Lisa O’Malley MLA, Steve Humphrey (Department of Local Government, Sport and Cultural Industries), Eric Mackenzie and Nikki Harwood from the West Coast Eagles, and Cam Sutcliffe and Kara Donnellan from Fremantle Football Club. Nuria Ushoroff was named Most Outstanding Primary Ambassador and Thomas Moscarda won the Most Outstanding Secondary Ambassador award for the third time. Both teachers were rewarded with a trip to Melbourne to watch the Elimination Final between Melbourne and Geelong. West Australian Football Commission Schools Specialist, David Lindsay congratulated the winners and paid tribute to all teachers for their work promoting the game. "Teachers throughout Western Australia do a power of work to give students an opportunity to experience Australian Football. We're fortunate to be able to acknowledge a selection of these teachers at our awards and highlight the amazing work that they do." he said. "We appreciate the partnership we have with both of the WA AFL clubs. It's also fantastic to have such a hard working group of metropolitan and regional staff to deliver high-quality programs within our schools." 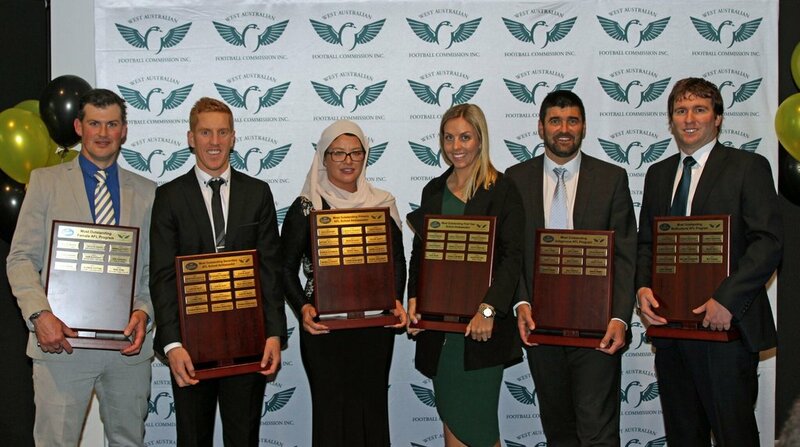 WEST Australian teachers were recognised for their outstanding work in promoting Australian Football in their school communities at the 2017 AFL School Ambassador Awards night at Domain Stadium on Thursday, August 10. In front of a supportive crowd of school and community football representatives, including special guests from Fremantle Football Club, the West Coast Eagles and Member for Bicton Lisa O’Malley MLA, 30 finalists were acknowledged and six category winners announced. Major award winners Christiaan Moir from Ashfield Primary and Thomas Moscarda from Wanneroo Secondary College, who went back-to-back in his award category, each won a trip for two to Melbourne to watch an AFL final. West Australian Football Commission (WAFC) Schools Program Manager David Lindsay congratulated all award finalists and thanked the attendees, school principals, teachers and their colleagues for supporting such an important program. at their schools,” he said. “Congratulations to all award winners who are all a credit to their school community with the volume of work they achieve to promote our great game in the classroom as well a form strong links to their local community clubs. “A special thank you to Elliot Yeo (West Coast Eagles), and Michael Walters and Kellie Gibson from the Fremantle Dockers who entertained the audience during a panel discussion with tales from their school football days. “I would also like to congratulate all WAFC District Development Officers and Regional Development Managers. The event recognises the outstanding work done by the teachers but also the effort our district staff put in to school programs and building strong relationships with our AFL School Ambassadors,” he said. All registered teachers are eligible to become a AFL School Ambassador. The WAFC provides training, equipment and support, free of charge. Click here for more information. A video of students talking about two nominees can be seen on our Facebook page. Seven football awards were presented for outstanding promotion of Australian Football in the school community at the 2016 AFL School Ambassador Awards night on Thursday, August 4. 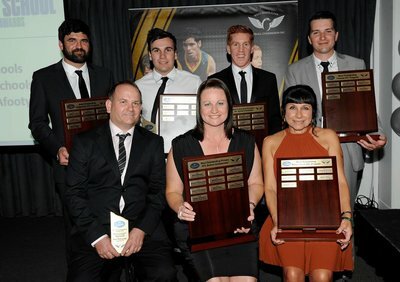 The awards night was hosted by the West Australian Football Commission (WAFC) at Domain Stadium in front of a supportive crowd of West Coast Eagles, Fremantle Football Club, school and community football representatives. Twenty-nine finalists, selected by a judging panel from a pool of more than 100 nominations, were acknowledged and seven category winners announced. Thomas Moscarda - Wanneroo Secondary College. Most Outstanding Primary and Secondary AFL School Ambassador award winners Narelle Scott and Thomas Moscarda each came away with a trip for two to Melbourne to watch an AFL final. WAFC Schools Program Manager David Lindsay congratulated all award finalists and thanked the attendees, school principals, teachers and their colleagues for supporting such an important program. Narelle Scott won the Primary AFL School Ambassador award for the second time in a row. The Baldivis music teacher created an AFL teaching resource pack for her school community and incorporated AFL songs into her classroom. Thomas Moscarda provided his students with the opportunity to travel to Cambodia and teach the local students the fundamentals of Australian Football. Mr Moscarda helped drive a 22-percent increase in specialist students attendance in football programs at the school. He also created a football app for students and parents. All registered teachers are eligible to become a AFL School Ambassador. The WAFC provides training, equipment and support, free of charge.